The first and least expensive option is tile. Yes, tile! A quick search on the internet will reveal prices from around $3.00 a square foot on up. With a wet saw and a quality bonding adhesive, the homeowner can renovate their countertops and achieve the granite look. While this is certainly the most cost-effective option, there are several cons. First, there will be seams. Lots of them. Part of the functionality of slab granite is the absence of seams which, in a kitchen, is a benefit. Water, sauces, oils and other cooking ingredients can seep into those seams. 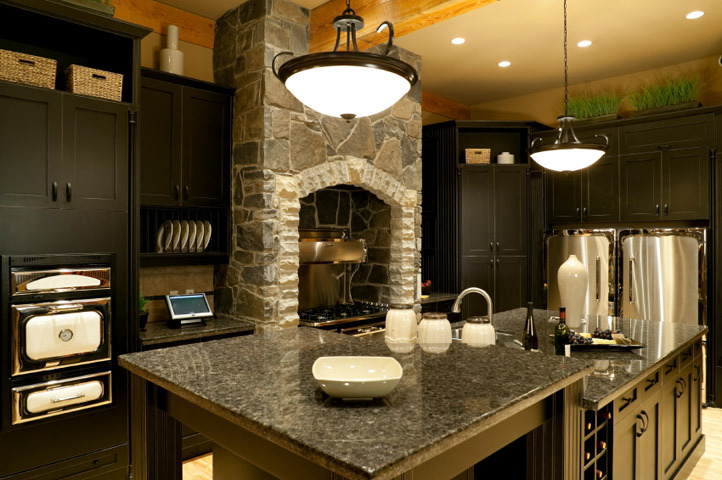 In addition, the aesthetic appeal of granite can be lessened by the presence of many seams. Tile is the most cost-effective option, but the cons may outweigh the advantages.
" If you are doing this for resale value... DON'T! " A second option lies somewhere between tile and slab granite. Modular granite comes in prefabricated sections that are meant to be installed in pre-existing kitchens. They include edging, backsplashes and sink cut-outs, and are reasonably priced. The do-it-yourselfer can perform the installation as well, making modular granite an attractive option for budget-conscious homeowners. The major drawback is, again, seams. Seams in a kitchen environment are not desirable. As well, the beauty of granite can be undermined by the prefabricated appearance or the quality of the install. However, it may be the route to go for the homeowner on a budget. "You will have seams and little to no consideration to color matching as you cannot adjust the stones position before cutting. This too will accent the seams"